I know it is a challenge to think about wraps, rolls and sandwich kind of lunch boxes if you don't eat breads much and generally depend on loads of vegetables, some lentils, some dairy, some poultry and some fish and meat for your daily meals, in that order. We often want our lunch box food the kind that can be eaten easily while grabbing the food with hands, something that doesn't get messy and we feel sated after the meal. There is a reason why wraps and sandwiches and burgers got so popular in the first place, they all give a tactile edge to the taste, making the meal a sensory pleasure perceived not just by the taste buds. Holding the food in one's fingers is an added pleasure while eating. So much so that we all started looking for similar foods even if we want to stay away from sandwiches and rolls, wanting to find substitutes of the same foods we want to shun. Okay, so these lunch boxes will NOT be wraps, rolls and sandwiches. But the same kind of convenience to bite into the food is the reason I am listing all these options of lunch boxes together. We are a country of parathas and dosas, we know how to roll our paratha and how to make the dosa fit for a roll. 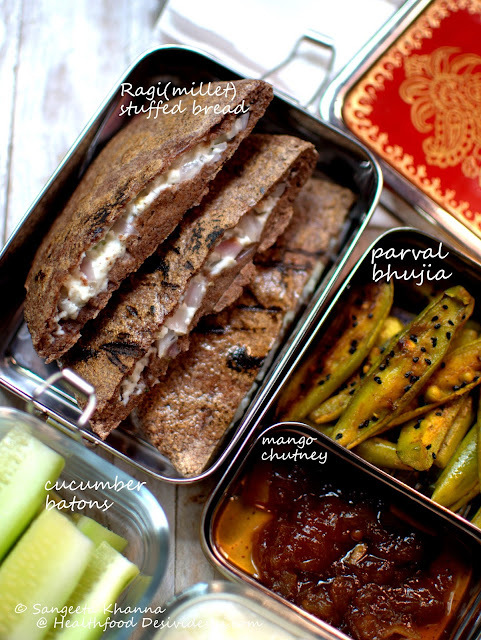 The lunch box options here are a suggestion of how to balance such paratha and dosa kind of meals and no, these are not one dish meals as one sandwich was never capable to hold all the vegetables I wanted to accommodate. Some vegetables are liquefied (blended) here to make chutneys, some mashed to make dips, some are blended in the batter to make the meal more vegetable rich. And there is more salad or fruit yogurt for variety. Here is my list of suggestions while making convenient (easy an quick to make) lunch boxes into balanced meals..
Take some time to plan the shopping, cleaning, chopping and sorting of the vegetables and fruits or delegate this work to someone capable. Do some planning on what all you need to carry the next day, or better for the whole week if you can. Cooking in batches works great if you find time only on weekends. 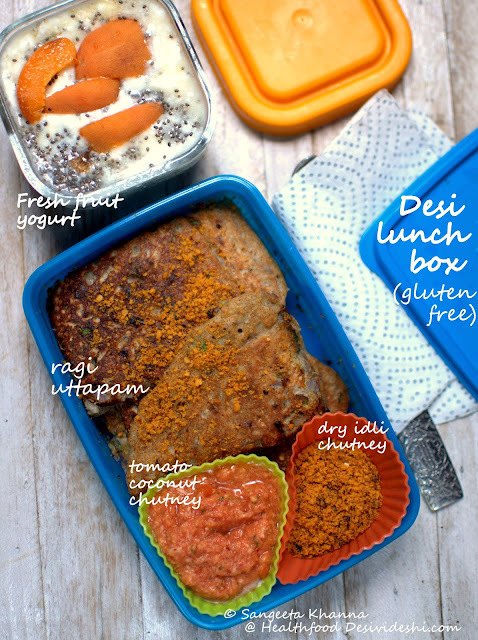 Plan and sort out the lunch boxes for the coming week and avoid any last minute hassles. Make the office lunch time a relaxed activity, a meal that you look forward to and enjoy all the textures and taste you like. Do not eat on your desk or just turn away from your work area while eating so you don't peep into the work mails while eating your lunch. Mindful eating is way more effective in managing your eating discipline than you imagine. It is good to balance carbs, proteins, vegetables ratio in every meal but do not sweat if you can't manage to do this for your lunch box every single day. The balance can be achieved by including the missing components in the other meals too and you can always carry an extra snack box with nuts and seeds etc. Better keep some roasted nuts and seeds in your office drawers if possible. 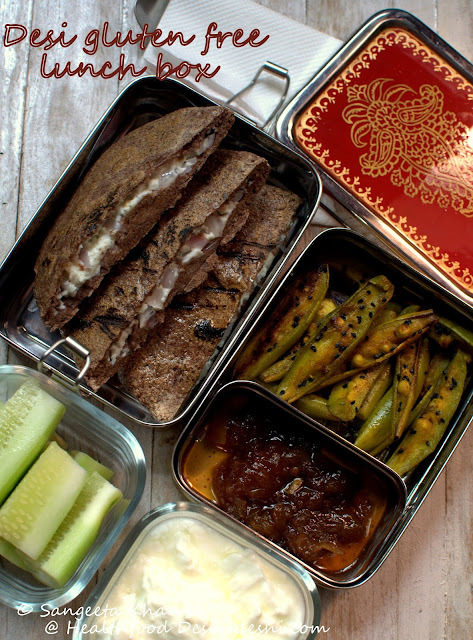 Include some of your childhood favourite foods in your lunch box occasionally so you involuntarily enjoy the lunch time and do mindful eating without much thought into it. Some of those stuffed parathas your mom cooked or the rajma chawal or tahiri or bisibele bhath will be great tools to make you eat mindfully. Try to balance those foods nutritionally, for example balance a paratha meal by having a smaller portion of the paratha with a large portion of salad and yogurt. Include some home made chutneys and sauces, dips and mayonnaise, some pickles if needed and give an extra edge to a quick lunch box. You could always get someone in the family make those for you or find a help who can do the job. Or else get creative and blend some roasted sesame to make tahini and then add some raw or roasted vegetables to it to make a saucy dip that keeps well in the fridge for a week. Use cream cheese or hung curd to make some herbed dips. I will do a detailed post on dips and sauces for easy lunch boxes here but just think we are a country of chutneys, there are so many recipes in the family repertoire already. And do not forget the importance of fermented foods. If you can't add some sauerkraut to your everyday salads, just carry some home made yogurt for the probiotic dose of the day. Make a fresh fruit yogurt in 5 minutes and enjoy at lunch time. Go gluten free whenever you can even for the lunch boxes. You will still find some comfort food options. Minimal gluten meals may be more practical if you are skeptical about taste. Below is the fruit yogurt that I make by simply chopping some fresh fruit into home made yogurt. I used apricots and mango cubes here along with some chopped almonds and chia seeds. I am sharing 11 lunch box options with you today. 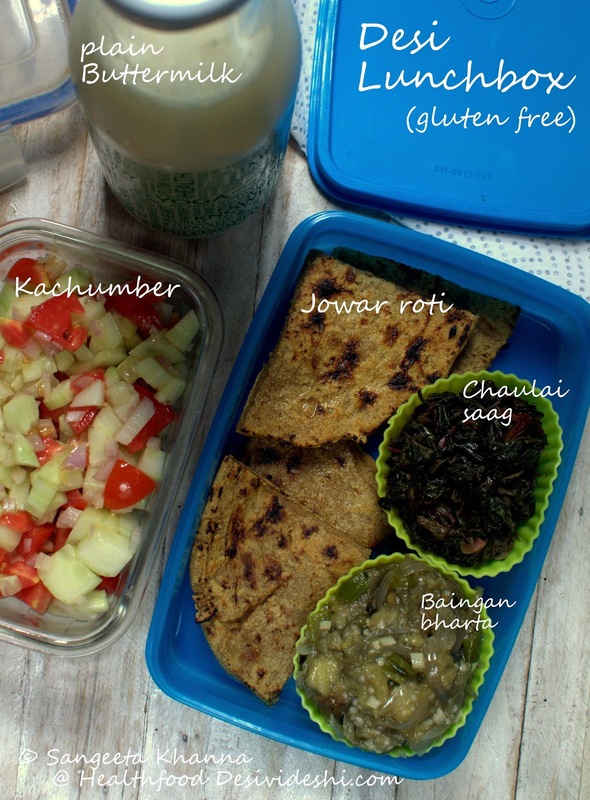 The main lunch box is a mixed grains gluten free (ragi, jowar, red rice and urad daal) uttapam to which chopped onions and curry patta has been added. I packed it with dry idli podi (a mix of roasted lentils, sesame seeds, coconut and chillies, tamarind etc) and a fresh tomato and coconut chutney (raw tomato, fresh coconut, little garlic and green chilly). This is almost like finger food making a filling healthy meal. You could make ragi dosa too for this kind of lunch box. Another gluten free uttapam (white rice, jowar and urad daal) made with chopped onions. I soak the ingredients for a couple of hours, blend them all smooth and often add a little sourdough starter to the batter and keep it overnight in a cool place. The husband calls these dainty uttapams as 'bread uttapam' these are so soft. The thick sambar you see in the picture is a one step pressure cooked sambar made thick so it carries well in the lunch box. I find this sambar so good I have it as a meal by itself. To make that thick one pot sambar just heat ghee in pressure cooker, add curry patta and sambar powder to roast very briefly and then add rinsed masoor daal (2 tbsp) and chopped lauki (bottle gourd, 400 gm), add a cup of water, salt to taste and pressure cook. Add a little tamarind extract in the last, stir well and pack. I use pumpkin or other vegetables too sometimes but whatever can be chopped the previous day is good. These flat breads are made of leavened dough. A mix of ragi and whole wheat flour (60:40) is kneaded with a little salt, sugar and sourdough starter and kept overnight. A mashed paneer mix with chopped onions, green chillies, salt and pepper is then stuffed into flat breads and is cooked over hot griddle just like kulchas. Smear the breads with ghee or butter before packing. That parval (pointed gourds) bhujia you see int he picture is very easy. Scraped and long quarter wedges of parval are stir fried with kalonji (nigella seeds), green chilly and little turmeric and salt, on low flame, till they start curving at the ends. The result is a nice stir fry salad that you will reach for after every bite of the stuffed bread. The mango chutney is in fact a well celebrated pickled chutney we called gudamba or khatta meetha aam ka achar. Adds oomph to any meal. This would be one of my favourite meals. Plain jowar roti (will share detailed procedure of making jowar roti soon) with some pyaz baingan ka bharta and chaulai ka saag is a rural meal that I have never tasted in villages but started cooking after seeing on TV. It makes one of the best gluten free meals trust me. The pyaz biangan ka bharta is quick. I keep the onions sliced and brinjal roasted and peeled in the fridge so it is a 3-5 minute affair in the pan if cooking for two. Heat mustard oil, tip in chopped green chillies (mild variety) and sliced baby onions (1/2 cup), fry till soft and then dump the roasted brinjal pulp and salt. Mash and stir for a minute and it is ready. Use green capsicum in the recipe too to make it more interesting. Chaulai saag is made with just mustard oil garlic red chilly tadka, dumped the chopped greens with salt and cook till soft and mushy. Takes about 5 minutes for 2 servings. The chopped salad or kachumbar is just a mix of chopped cucumbers, tomatoes and red onions with some salt and mustard oil drizzle. Drop of vinegar added if the salad is being packed for the lunch box. Jowar ki roti meal needs a plain buttermilk that tastes divine after such a meal. 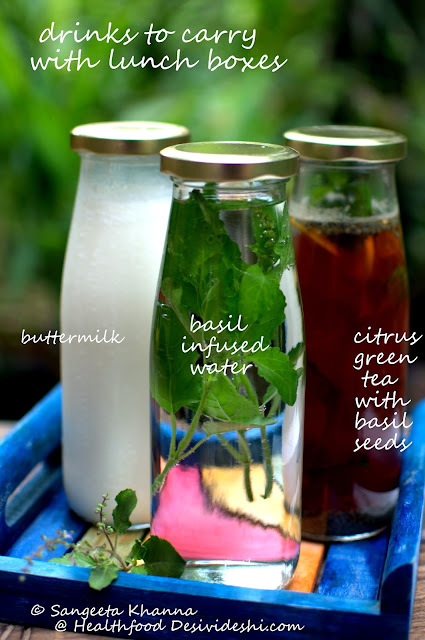 Get a nice bottle to pack buttermilk or chilled tea to office. 5. 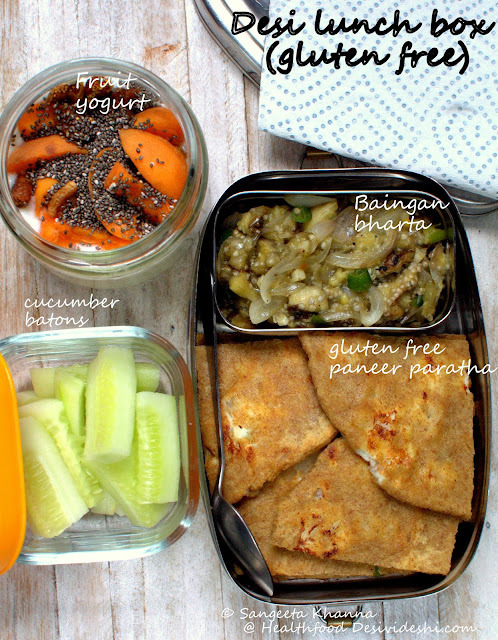 Multigrain paneer paratha lunch box.. The mashed paneer stuffing used for the ragi flat bread is used here too. The dough mix is a mix of barley and chickpea flour which tastes really good. One thing to take care of when making such a stuffed paratha is, that the consistency of the stuffing should be the same as the dough to be able to roll the stuffed bread easily. You see the same baingan bharta with this paratha meal too. We love baingan bharta and it is so easy to make once the house-help roasts the brinjals, peels them and packs them in the fridge for the next day. Cucumber batons when one can't chop a detailed salad. Fresh fruit yogurt with fresh apricots, dried figs and chia seeds is great. Can be an evening snack too if the yogurt is kept in a cool place. You can freeze the yogurt the night before as this way the yogurts stays well for at least 6-7 hours in the office if you intend to eat the yogurt late. This wrap has potato and tuna salad as a stuffing. The tuna is from a tin but you can buy tuna fish, poach it, flake it and freeze it for use if you don't want to use tinned fish. I use tinned tuna and sardines occasionally. Tuna and potato salad can be made in so many different ways that it does not surprise me any more. I have made it the Bengali way, the south Indian way and even with peri peri sauce. Here is detailed instructions regarding how to make soft ragi roti. For this wrap you can use any salad you wish, some leftover chicken or paneer tikka or even hummus and some raw or steamed vegetables. 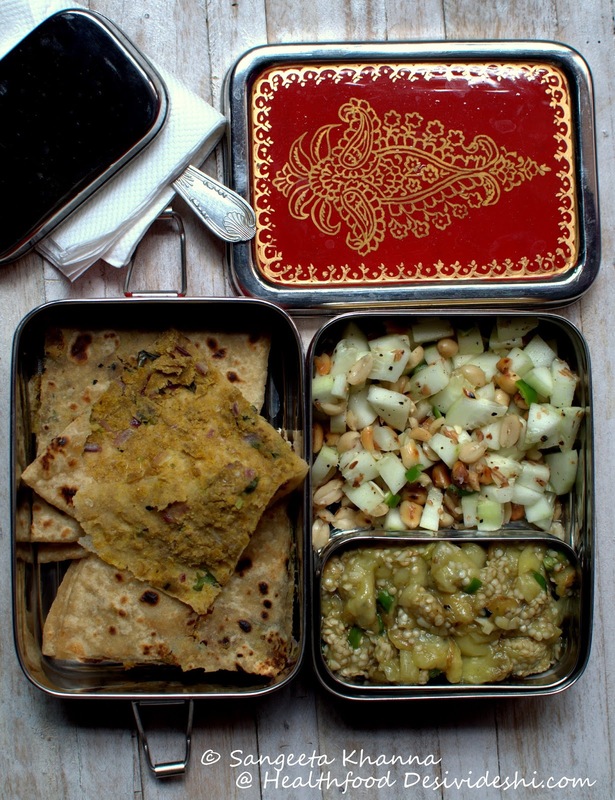 A mixed grain thalipeeth also makes great lunch box meal. There is a little home made paprika mayonnaise in the green silicon cup on the side that makes a delicious dip for this wrap. The chopped salad box gets whatever I can chop that day, the salad ingredients are chopped fresh and not the previous day BTW. This one is for the days you wake up late. The patoda rolls (see recipe here) in the fridge make a great stuffing for a plain multi grain roti. 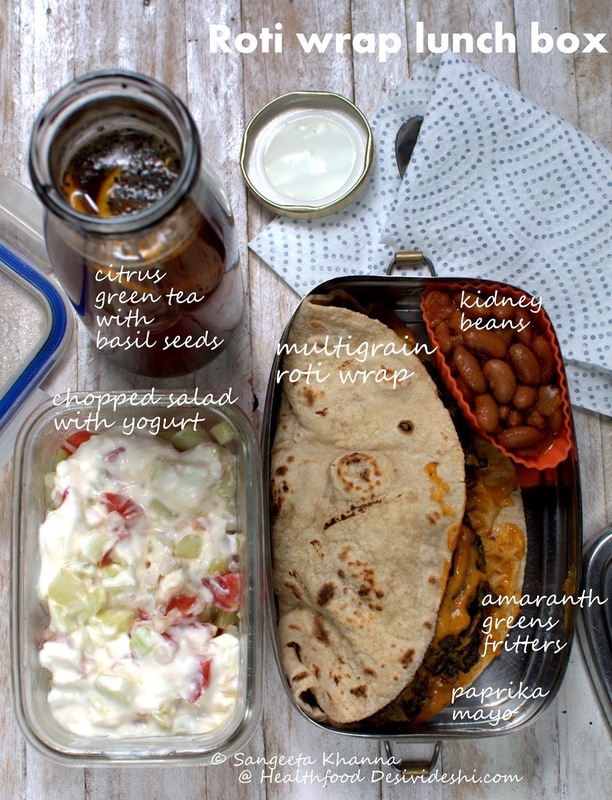 Pack some diced cucumbers and plain home made yogurt and get set for the day. That big roti hides 4 large patoda rolls, very filling, very tasty and needs no chutney or dip if you are carrying cucumber or kachumber type salad if have time. Or else pack some green chutney or even home made mayonnaise with it. I prefer not applying the chutney or mayo inside the wrap as it makes the whole thing soggy if packed in the lunch box. Okay, mayonnaise doesn't make it soggy but drips while eating, so better pack it separately and use as dip. 8. Chaulai (amaranth greens) pakoda wrap lunch box..
Another lazy day's roti wrap can be made with any leftover fritters, chicken tikka or paneer or veggie tikkas. Here I have used amaranth greens fritters for the purpose. The multigrain roti is smeared with paprika mayonnaise (home made) and fritters are wrapped inside. These are lentils based fritters that we make sometimes for dinner or weekend breakfast, the leftover fritters can be frozen and used as desired. I have packed leftover rajma with this, and a chopped salad with yogurt, almost like a raita which makes this meal really satisfying. Citrus green tea with basil seeds is great to take with lunch boxes too, especially during summer and monsoon time. You can add fruits to the chilled or iced green tea as well, just like this peach tea with basil seeds..
Ragi bread can be made in the oven or in a skillet. While oven baked and skillet baked bread needs some time, the steamed bread is almost instant if you have prepared the dough in advance. Half a cup of sourdough and 1/2 cup each of rice flour, black lentil flour (urad daal powder) and a cup of ragi flour is mixed with a little salt and sugar with enough water to make it a loose dough or a thick batter consistency, and is fermented overnight or for 5-6 hours. This batter/dough keeps well in the fridge for a week. About a cup of this batter is spread on the steamer lined with muslin and is steamed till the bread cooks, a knife comes out clean when poked. The steaming of this bread takes only 8-10 minutes. Brush the cooked bread with ghee or butter immediately, slice when a bit cold. I packed a sour cream dip with basil and chives along with a green almond and rucola pesto here. The sour cream dip includes some minced fresh basil and garlic chives along with salt. The pesto has green almonds, rucola, olive oil and salt. You can add some Parmesan or fresh cream to this pesto. I find fresh cream in rucola based pesto better. 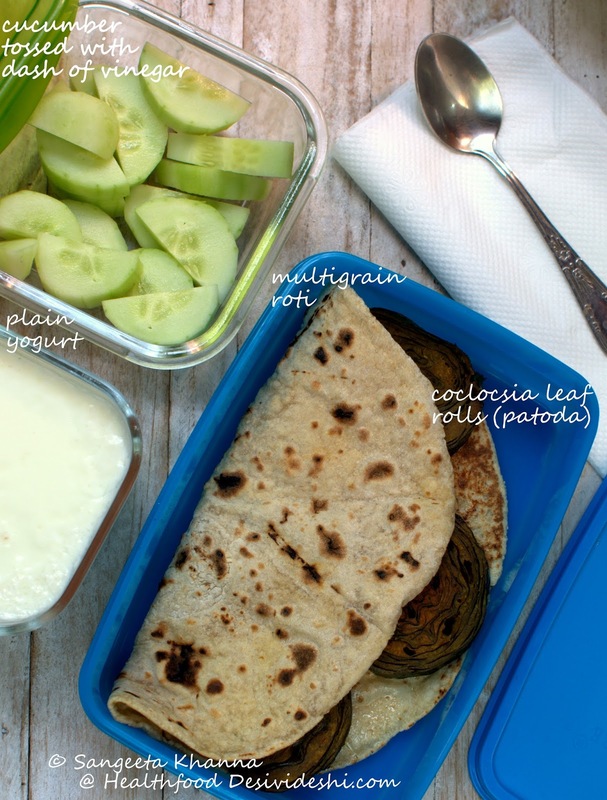 This steamed ragi bread can be slit in the middle like pita bread and stuffed too, but the stuffed steamed ragi bread wouldn't hold well for a packed lunch, that will be better consumed immediately. I like the dip and pesto being applied slowly and eating the bread relishing the flavours. Pack peanut butter or jam or smooth scrambled egg with this bread and enjoy. Here is a dosa sandwich that I make sometimes, to be packed with a paprika mayo (homemade of course). Just make regular multi grain dosa a bit thick, cut into quarters and stuff mayo based salad between 2 such wedges. It stays very well in the lunch box and doesn't get soggy at all. This sandwich doesn't taste like dosa much, the filling is the game changer here. This is one of the most favourite childhood lunch box paratha that both of us love. Sattu ka paratha was a regular monsoon delicacy because it doesn't spoil easily, one of the healthiest desi meals I must say, even though it is made of whole wheat flour and is not gluten free. And there you see the baingan ka chokha. The chokha is different from bharta in being just roasted and mashed and not fried in a pan. Just mash roasted (char grilled) and peeled brinjal (preferably the round ones) with minced garlic and green chillies, some salt and mustard oil and it is a luscious goodness you can't resist. The cucumber and roasted peanuts kachumber or kosambari is no rocket science either. Just mix some roasted pounded nuts and whatever greens and cucumber you like and drizzle some lime juice, some salt and little sugar to balance. 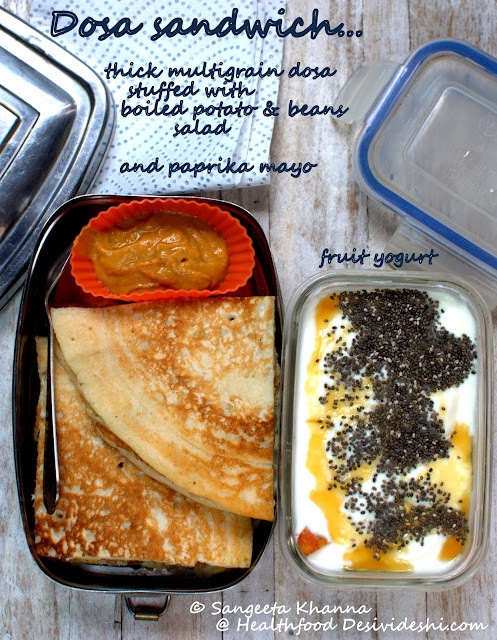 We like plain buttermilk with this meal and somehow I forgot placing the bottle along with this sattu ka paratha lunch box. Buttermilk can also be chilled or frozen overnight so it stays good for a few hours in the commuting time and the office. I pack 2 bottles of buttermilk for myself sometimes, just for the home work desk I mean. It reminds me that I have something to drink for comfort. Else I just keep sipping water. Guess what more I have for giveaway? Tell me in your comments below, make a guess. I will announce the next giveaway in the next post of the series. I intend to post a good number of posts about lunch boxes and a few more giveaways are scheduled. Keep commenting and telling me about your preferences and requirements regarding lunch boxes and enter a chance to win something interesting and useful to make your lunch boxes fun. I understand some of you are waiting for the next posts of this series, your mails and messages reach me and I feel glad that you are finding this series useful. But it takes a lot of time, sometimes 10 hours of work to make a post like this one, so please bear with me while I create the new posts. I promise I will bring something useful and healthful. There are more giveaways, to enter you have to tell me what you prefer in lunch boxes and what suggestions and ideas you would like to know. Write you comments here, there are a few useful pretty things up for grab the giveaway will be announce by the end of July. The giveaway is open for India only, I can ship your reward to an Indian address if you wish. There is a pretty hand painted lunch box as a giveaway from Trove and another useful steamer from Tupperware to win as well. don't forget to comment.. Note that all these healthy lunch boxes are not recommendations to loose weight although they may be helpful for the cause by default. I feel disappointed when any health advise is taken as a way to loose weight. Everyone has different health concerns and must follow a diet regime that works best for one. Sigh. wish i was working in New Delhi, and I even more wish i was staying with you . But what lovely gluten free ideas, and might try the ragi-paneer kulcha stuff, with immediate effect for some folks here who are crazy about paneer. (I am not). Give me the buttermilk any day, with a bit of ginger . crushed mirchi and salt. And yes, Hing ! I always carry a glass of Buttermilk infused with Hing. Perfect drink after lunch. You are such a good cook yourself Himanshu but I agree, it is something else when someone prepares meals for you. Wow.. this is such a wonderful post. Awesome ideas for lunch box.. healthy as well as filling. Too bad that I am done with packing lunch boxes for my kids and hubby as well. But I am surely going to share this post with my friends Sangeeta.. Thanks Sonal, I love overnight oats too but I like to mix and match because I get bored with one type of foods easily. I keep adding things to overnight bowl of yogurt. Have been taking pictures, those will be shared soon too. This is brilliant.. So easy to prepare and pack! O wow, was thinking of asking you today afternoon if the lunch boxes that you shared on FB would serve as brunch too, and here I see the post on lunch boxes. 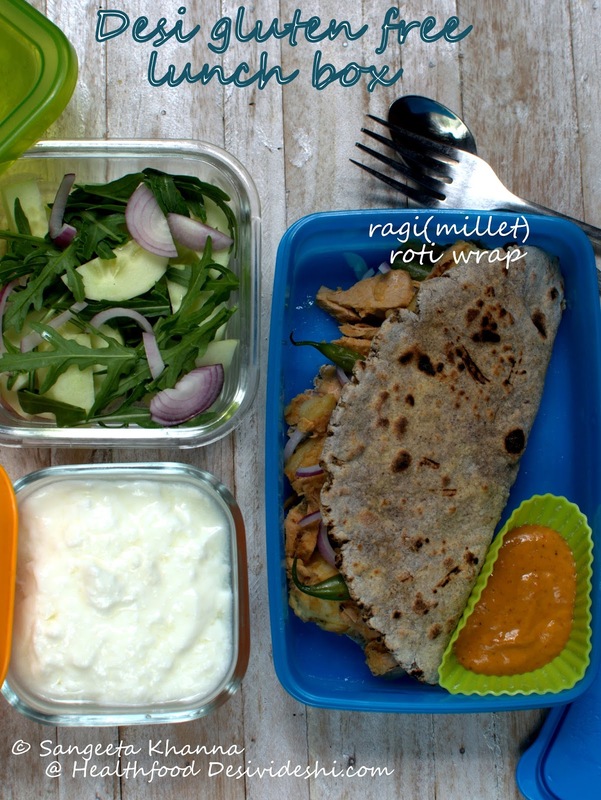 How do you ensure that these mixed grains rotis/ parathas/ wraps don't get hard & dry by the lunch time? Love those bottles, where did you buy those? Thanks Puja. These multigrain parathas are stuffed with semi dry filling. The paneer filling and the tuna potato salad in fact makes the parathas moist and soft. The dry pakoda wraps are mostly made with whole wheat roti or wheat barley roti that stays good. And I don't skimp on applying ghee :-) Ghee is good. Looks like this post was written just as per my requirements ? I did mention in the “vegetable fried rice “ post that I was experimenting with millets, and here is your post with the two things I love the most – Millets + Bread/Roti. 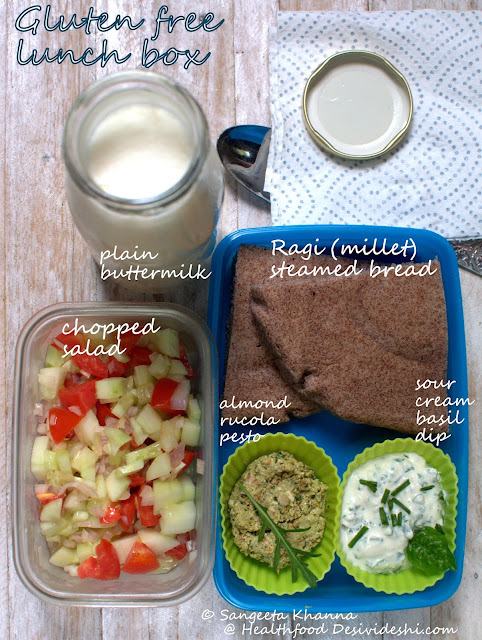 My family loves bread and your post just gave me a few new ideas to make Healthy Bread at home … I am familiar with Jowar roti…but ragi roti is new for me, can’t wait to try it out this weekend. Thanks a lot! Luv ya! PS: Next giveaway is - Glass Drinks Bottle ? Millets are a staple in my home and we keep using many millets, be it ragi, jowar, bajra, sama, kutki or Jau. Hi Sangeeta! My older son hates sandwiches! I can see him eating some of these lunchbox items, especially the paneer parathas! Thanks so much for these suggestions! Thanks for commenting Roshni :-) Will try and bring more options to suit your requirements. Just stumbled upon your Blog! What a treasure it is....hats off to you. Cannot express through words my admiration for your work. And thanks a tonne. What a well thought out post ! Super work Sangeeta.. everything looks wonderful and delicious. I'd love to try out these for our regular meals as well. This is such a useful post! What to pack for lunch is a constant headache for me. I like rice/roti and usually pair it with a sabji, dal and curd. Sometimes, I make vegetable pulao and combine with chicken curry. But, I struggle to bring some variety into this. 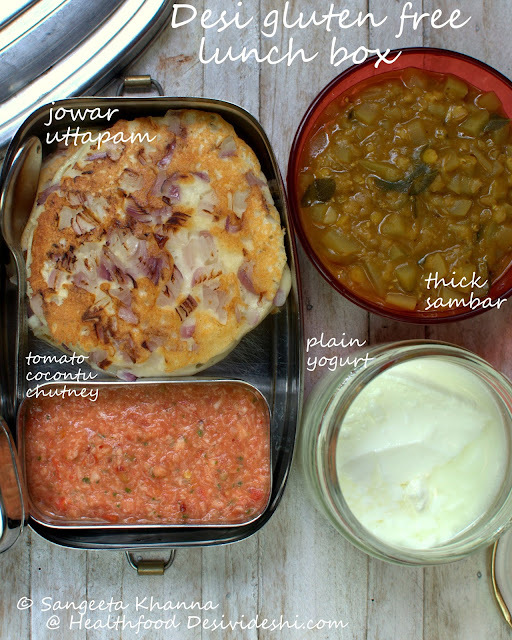 For my lunchbox, I would like to have options for one-pot meals which are not very dry and different kinds of paratha fillings. Sauces and dips with easily available indian ingredients will also help. It will be nice to have a few non-vegetarian options as well. I also have the habit of snacking in the evening- I try to avoid the office cafeteria and have something like nuts/ homemade cake. However, I would like some savory, healthy, filling options which can be made over the weekend and stored. Bookmarking the page! Thanks for sharing some really good lunchbox ideas! For my son's snack box, I often pack veggie wraps..wholewheat flour roti +shredded/ sliced raw veggies like cabbage, cucumber, onion,grilled potato and paneer tikki/ Kaala channa tikkis, and spiced up hung curd (salt, oregano, mint, thyme etc). Sometimes I marinate paneer and refrigerate it overnight and just grill it in the morning.At times I use fried Puri as a wrap.Then moong parathas, Dal parathas, paneer parathas and even mix veg parathas with dahi and papad are his favorites.He loves bread pakoda too. Whole wheatflour crumble ( thick roti, cooked and crumbled, some added sugar and tempering of ghee) is his yet another favorite.He dislike sandwiches but is a sucker for bread cutlets (Garlicky potatoes stuffed in bread, rolled and fried). Idli chutney makes him happy too. For long break, its mostly dry subzis like methi aloo, gobi ki subzi, gobi keema, bhindi pyaz etc, along with plain roti or koki (sindhi savory roti). At least once in a week he carries lola, again a Sindhi sweet roti made from jaggery syrup, atta and ghee/oil. It tastes great with dahi or boondi raita.Thepla with dahi or mango murraba, Poori aloo ki subzi and Besan ki roti (besan, onion, chillies, coriander, annardana, ghee/oil, salt) are some other options that I find easy to make early morning and that stays good till the long breaks. Wow! 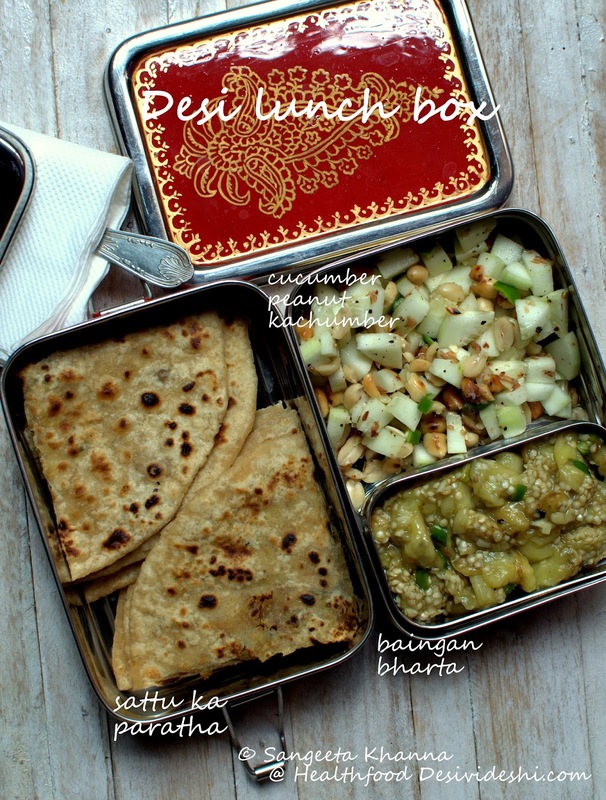 Such a beautiful compilation of "simple to put together" lunch boxes! Thanks for the hard work you put in! 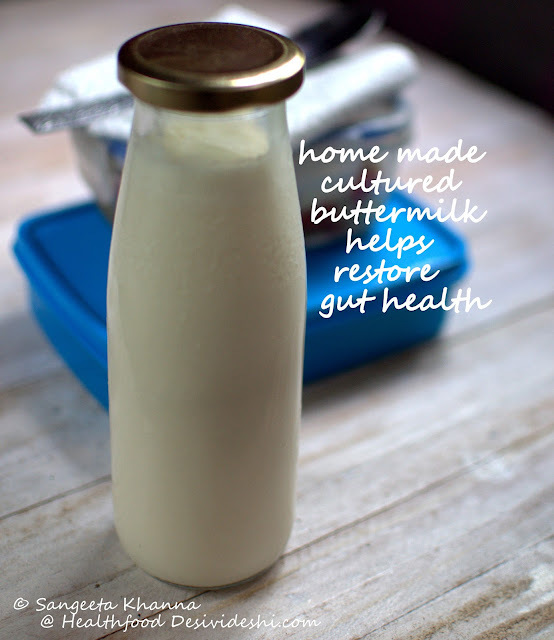 M curious about where could I procure the glass bottles you have used for buttermilk. could you suggest any online places to buy these? Also, would love to hear if you have any tips on carrying glass bottles and boxes carefully.